71-year old Sylvester Stallone took to social media to share a video of himself in the gym doing pull-ups with an additional 100 lbs. of weight attached to his body while 60-year old Dolph Lundgren released a 6-minute video of his workout routine. The two actors are taking their training for Creed 2 very seriously and are putting people that are half their ages to shame. Michael B. Jordan announced a few weeks ago that production on Creed 2 was going to begin in a few months while he was out promoting Black Panther. For a man who was rumored to be dead a few weeks ago, Sylvester Stallone is looking remarkably fit. The iconic actor shared a video of his pull-up abilities on social media, which comes off as a humble brag. The intense pull-ups with the additional 100 lbs. of weight was captioned by Stallone, who said, "Another easy workout! You're only as old as you and your joints feel! LOL." Easy is definitely not the word one would use to describe this workout routine. 60-year old Dolph Lundgren shared a 6-minute montage of all of the hard work that he's putting in for Creed 2. The actor is with a personal trainer who can be seen pushing Lundgren and correcting his posture and lifting habits. While Sylvester Stallone was rumored to have been dead a few weeks ago, Lundgren had double hip replacements 6 months ago. However, you would never know it by watching the way he trains. The actor is seen doing some rigorous training with what looks like relative ease and even throws an Arnold Schwarzenegger joke in at the end of the video. Sylvester Stallone wrote a screenplay for Creed 2 over the summer and has been working with Cheo Hodari Coker to fine tune the story. Stallone was originally going to direct the sequel, but it was later announced that Steven Caple Jr. will be taking over to helm the project. Ryan Coogler directed the first Creed movie and when asked why he wasn't on board for the sequel, the Black Panther director stated that it was all about time. The studio wanted to begin working on the project while he was still working on Black Panther, which would not have worked out at all. Dolph Lundgren was first introduced as Ivan Drago in the fourth installment of the Rocky series in 1985, and now he's back to reprise his role. Romanian heavyweight boxer Florian Munteanu is set to play Drago's son in Creed 2 and he'll face off against Michael B. Jordan's Adonis Creed. Sylvester Stallone has previously stated that, "It wouldn't be a party without Drago, would it?" when asked about the return of Lundgren. Stallone took it a step further by saying, "I'm gonna punch him. You know I gotta hit Drago once." With all of the intense training going, there's definitely going to be a lot of punching going on. 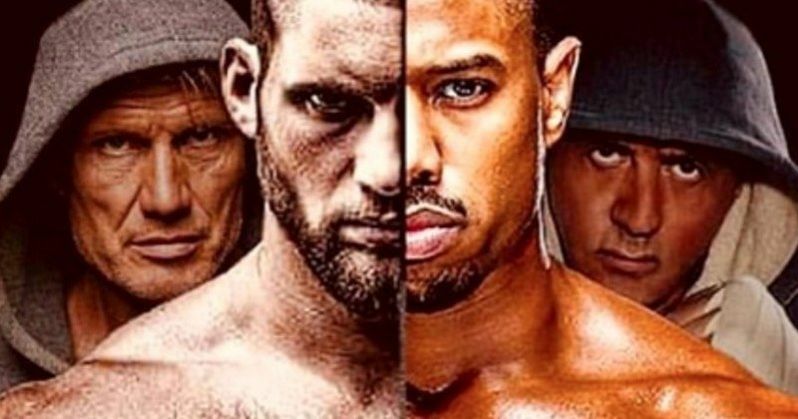 You can watch both actors prepare for Creed 2 below, thanks to Sylvester Stallone's Instagram page.